Is This The First-Ever Kia Race Car? 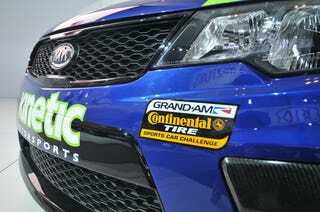 The Kinetic Group has built a Grand-Am Continental Tire Challenge car out of a 2010 Forte Koup. Andy Lally and Nic Jönsson are signed on to drive it. A Korean manufacturer in professional touring car racing? Has this happened before? Update: As we suspected, this isn't the first competition Kia. The Korean marque's cars have run in the WRC, SCCA Pro Rally, and as touring cars in Europe. Thanks for the help, everyone!